Soon after the Galaxy S5 was announced by Samsung during the Mobile World Congress, cloners started making fakes of the new Android smartphone. Only two days after it was unpacked, a phoney S5 under the name of Goophone S5 started popping up in China. 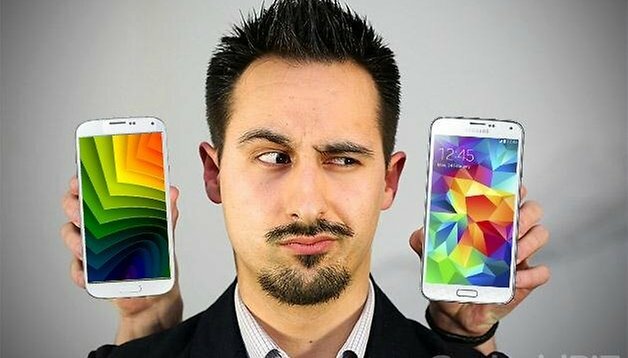 If you are planning on buying a Galaxy S5 soon, and not from a mobile provider or Samsung themselves, then it might be a good idea to take a look at these tips to learn how to tell if a Galaxy S5 is fake. Goophone produced a fake that could easily pass for the real deal if you look at it from afar, seeing as they also adopted the Band-Aid-like plastic on the back, and in fact, it isn’t that bad of a phone, though we don’t condone buying a fake S5, which is an IP infringement. Another one has just appeared as well called the No.1 S7 made again by a Chinese manufacturer, this time under the name of GizChina. This fake model is waterproof, unlike the real S5 which is only water-resistant, but only has a 13 MP back-facing camera with autofocus and an octa-core MT6592 processor ticking at 1.7 GHz with 1 GB of RAM. On the other hand, it does come with USB 3.0 and a 5.1-inch Full HD display and microSD slot. It only comes with Android 4.2 OS though. Take a few pictures to see how well the camera fares. Also, some new S5 camera features such as real-time HDR or Selective Focus might be missing. There is no fingerprint scanner on the home button or heart-rate monitor under the LED flash on the back. There aren’t any typical Samsung smart features, such as Smart Stay or other gesture controls, which you can find by going into the settings. Careful, some fake versions may still have the Google Play Store installed. If it's there, but you still aren’t sure, check to see if you can find any Samsung-specific apps, such as S Health, ChatOn, Samsung Wallet, SideSync 3.0 or Samsung Content Viewer. The USB is version 2.0 and not 3.0: the slot looks different. In the case of the v.3.0, it has two ports in one, while the v.2.0 only has one. The app names and settings might all be in Chinese. You are buying it before April 11th 2014, the official release date of the Galaxy S5. The same goes for any other smartphone. It's best to check its authenticity if buying from a third-party provider or another person. What do you think about fake versions of popular devices? Is it wrong to buy one or do you care more about your wallet than respecting the brandname? Hope this isn't a stupid question but if my charger slot looks like the one in that image does that mean i've got a clone? where to buy the cheapest one? You can buy samsung GALAXYS S5 I9600 mobile from HDC Mobile Phone. There you can add the available product to your cart and buy from online. Besides, you can add additional accessories to your buying list. And the total bill will be automatically populated accordingly. but well there arent only providers and samsung directly selling the device. I mean you can get into the next electronics store and buy it there, but still except for the older android version the fake looks pretty solid, especially the front cam which COULD be better coz more MP.